And on the heels of the Saturn digital audio mod here's one for the dreamcast. 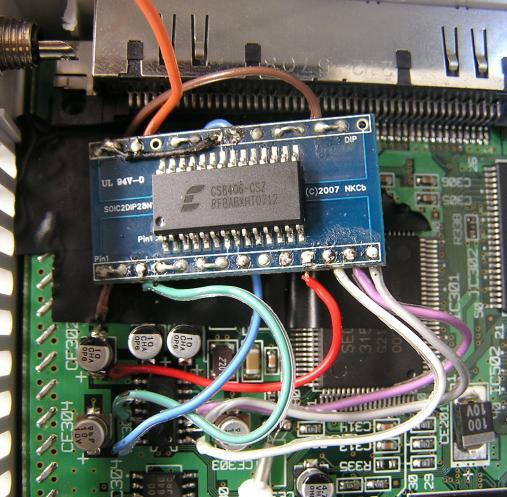 The dreamcast generates digital audio internally and then passes it to a digital analog converter chip. As it uses an off the shelf d/a converter (PCM1725U) it's possible to interface the digital audio signals to an S/PDIF transmitter IC that will transform the digital audio into a form your amplifier will understand. Here are the hookups for the Cirrus CS8406 chip I used here. I looked at the data sheets again. The EMPH line on the cirrus chip is high for no pre-emphasis. Pin 12 on the PCM1725U is high for de-emphasis active. Therefore the signal should be inverted. My first mod using the CS8406 was adding digital audio to the saturn. I wired everything directly to the chip. It worked but was a rather nerve wracking experience. This time I used a soic to dip adaptor board and the soldering was a lot easier. The board adds a bit to the cost but it's worth it. You can't see it in the pic, but there is a small capacitor between +5V and Ground. The chip works without it but it seemed a good idea. A few notes on installation: I soldered the +5v and GND leads to CF302 rather than the chip as access is a bit easier. When placing the toslink optical transmitter or RCA jack make sure you do a dry run and put the board in the case with the top and bottom rf shields in place. For instance I put the RCA jack around the corner from the expansion port and found that I needed to put the top shield in place before I soldered the orange TXP wire to the RCA jack.